Our blogs focus on AAVUL's many wealth and investment planning applications. In various surveys asking people about the greatest inventions of all time, electricity, clean water, penicillin, engines, and the internet came out ahead. Insurance didn’t make the list. In fact, one of the core foundations that allows the global economy to function efficiently is risk sharing, the concept defining insurance. Whether it be companies or individuals, knowing that catastrophic financial loss is protected enlivens risk taking while undergirding a willingness to commit investment capital. Many of the top product inventions would not have made it from the lab to production and into people’s hands if insurance didn’t exist. 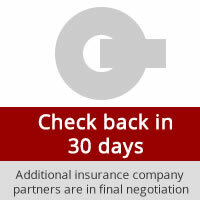 Insurance allows people – individuals or business leaders – to proceed confidently in the face of an uncertain future. Because insurance (risk sharing) is so vital, most developed countries enact laws that make insurance either favorable financially (life) or mandatory (auto). Knowing that valuable financial assets and human resources are protected facilitates the free flow of capital in the form of bank loans, bonds, and equity. With individuals, protecting property and lives through insurance brings peace of mind that otherwise would be lost, if, for example, financial ruin resulted from a car accident, home fire, illness, or a breadwinner’s death. One would think that insurance’s importance as a financial bulwark and peace-giver would elicit good feelings, but that isn’t the usual case. Studies repeatedly reveal that insurance products have bad reputations as too complex, too costly, and too pushy. This is not a malady for the concept of insurance, but how it has historically been designed, marketed, sold, and serviced. Private wealth advisors are not immune to having had bad insurance product experiences. The way insurance products are designed and executed brings unnecessary complexity. While consumers are often flummoxed, these same people hire advisors to be experts in their place. This brings fee-only advisors a day-to-day challenge along with a business risk. First, it takes time – a precious commodity for a service provider – to become an expert in insurance products’ fine print. Second, advisors face this complexity with an even bigger burden: if a complex insurance product is misunderstood and then misapplied, the client could be hurt financially and damage the advisor’s relationship. Selling life insurance products requires a license to do so. In most insurance company distribution models, this required “ticket to the game” allows an agent to have a seat at the client’s table for each insurance product transaction. Meanwhile, agents (especially life insurance) with a seat at the transaction table increasingly are expanding their own services to include financial planning and investment programs. For the fee-only advisor, this expansion represents a potentially unwelcome, competing voice of thoughts and plans within the client relationship. The common compensation method for insurance products is a sales commission. All transaction-based compensation methods tempt a seller to seek his or her own financial self-interest instead of the buyer’s best interest. The fiduciary standard – seeking the client’s best interest in all circumstances – is a cornerstone of the fee-only advisor. Mixed compensation methods in an advisory relationship open the door to both confusion and conflict, producing hesitancy with the fee-only advisor (the one with the most to lose in a bad outcome). For some fee-only advisors, bad insurance product experiences may lead to an expressed “not for me” attitude whereas others may react more subconsciously, but with the same biased reluctance. Adhering to the fiduciary standard pushes advisors to continually rethink and recalibrate. For example, ETFs forced fee-only advisors to reconsider their mutual fund devotion. Now, advisors liberally allocate assets to ETFs, sometimes even to the exclusion of mutual funds. The fiduciary standard is a prevailing call to stay current with planning and investment innovation. From new investment categories to rebalancing practices to practice management methods, an advisory firm’s willingness to innovate sets the stage for long-term growth. Indeed, with fee-only variable annuities and variable universal life products (responsive to the fiduciary standard), the advisor stays in the essential role as the builder, manager, and monitor of the products’ underlying portfolios. This keeps an insurance product’s invested wealth fully integrated in the client’s wealth and investment plans. The advisor gains an essential investment resource, the client gains peace of mind (and a highly tax-advantaged investment experience), and innovation reveals itself in the wealth plan. Advisor-Applied VUL is a vastly different – and more powerful – wealth-planning tool than your past experience may suggest. You and your clients gain VUL’s high-value benefits but the obstacles that may have prevented you from using it in the past are stripped away. It’s low-cost, one-step tax alpha. Embrace Tax-Free Portfolios For Your HNW, High-Income Clients. Embedded in the Fiduciary Rule discussion is the advisor’s compensation, with the rule’s explicit preference for fee-based versus commission-based services. While there are substantial debates about the merits of either approach, the client’s costs for financial and investment advice are the central focus. Of course, if there weren’t benefits associated with the costs no one would hire an advisor (i.e. the #9 reason), but the practice management challenge advisors face is developing a formula for showing clients the dollar-based benefits to contrast with the out-of-pocket costs. Like it or not, many clients have some measure of a nagging anxiety wondering if the costs they pay are “a good deal” compared to what another advisor could offer or, even, going it alone. Naturally, an advisor’s biggest impact is modifying the client’s spending and investing behavior. 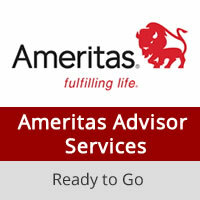 This is accomplished through planning services and an advisor-client accountability relationship. However, among an advisor’s non-planning, tactical services, tax management has the highest impact, substantially beating portfolio rebalancing and investment fees as shown in Chart 1. The advisor’s added value translates to more wealth through the advisor’s actions than had the investor operated independently. Compared to a commission-based advisor, a fiduciary advisor has a built-in advantage in calculating Benefits from the executed investment plan. Essentially, a fiduciary seeks investment efficiency first (known as “Beta”) and investment bets second (“Alpha”). Transaction-based compensation motives are not considered. In other words, making investment decisions for the client’s best interest (i.e. the heart of the fiduciary rule debate) allows an advisor to freely integrate lower investment costs in which ETFs and/or passive mutual funds serve as the portfolio’s core instead of more expensive (and possibly proprietary) active options. With the core driving the primary investment structure for the short- and mid-term planning horizons, the fiduciary advisor can make supplemental allocations to long-term portfolio satellite positions; common satellites being aggressive fixed income (e.g. high yield; convertible bonds; non-US), non-US stocks, small cap growth, REITs, and alternative investments (e.g. hedge funds; direct lending; private equity). In addition to high investment costs, there are three other key ways that wealth is lost: market downturns; overspending; taxes. These leakages have been covered in the blog “Preserving Wealth through Tax Alpha”. Each dollar that is NOT lost allows the portfolio to compound from a higher floor; this has real economic importance for a client’s wealth creation. 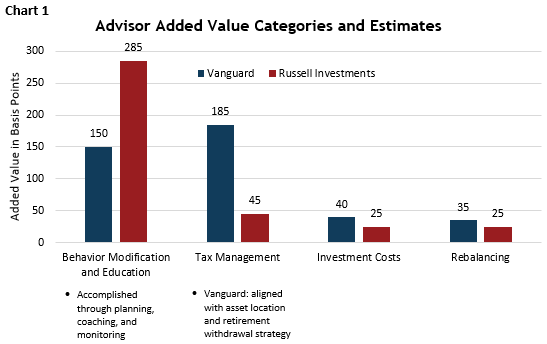 While client behavior modification has the highest advisor impact (from the above Vanguard and Russell studies), it’s also the most difficult to quantify. The four leakage categories, in contrast, can be calculated by comparing the executed plan to other options. AAVUL provides perfect tax efficiency (a tax shield) in a single step. And, AAVUL products come with no sales commissions, trailers, or surrender charges, in addition to having low internal costs. For a given dollar, 98% to 99% of the invested amount in AAVUL goes into the tax-free portfolio, with the majority of the policy’s costs applied to a valuable death benefit. 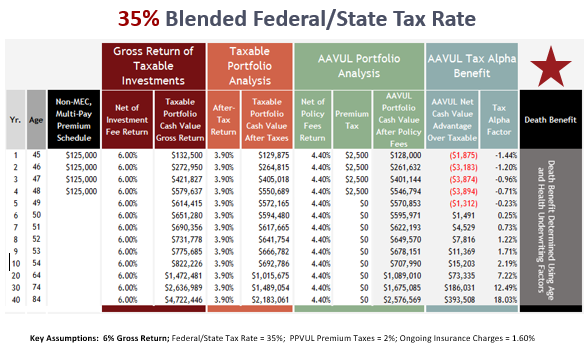 AAVUL’s tax shield is the interplay between three factors: 1) the client’s blended federal/state income and capital gains tax rates, 2) the AAVUL’s portfolio return, and 3) the policy’s costs. As Figure 1 shows for a typical HNW portfolio, simply taking investments that benefit most from AAVUL’s tax shield (corporate bonds, high yield bonds; convertible bonds; tactical allocation models; non-US stocks and bonds; REITs; direct lending; hedge funds; small cap growth; private equity) from the HNW client’s taxable portfolio and asset locating them inside an AAVUL policy generates compounding client profits over time (see the blog “Asset Location: Meaningful, Clear, and Easy”). The client’s profitability has a remarkable outcome: AAVUL’s tax savings (provided by federal and state laws and regulations less the policy’s expenses) essentially gives the client increasing wealth at a compounding rate while also providing a tax-free death benefit worth millions of dollars. This death benefit then leads the advisor to a valuable implementation tool for wealth transfers, wealth replacement, and charitable giving. Truly, no other wealth planning tool offers such a wealth-creation package. Many advisors possess biases against insurance products from bad experiences with complexity and high or hidden costs, combined with difficult distribution relationships. Few would dispute the caution that evolves. Nonetheless, innovation has been occurring in the insurance industry. The fiduciary advisor’s determination to use the best planning and investment solutions must consider this innovation in the full package that AAVUL offers HNW clients. An advisor that produces ongoing summaries proving the profitable outcomes he or she produces for each client solidifies the client’s trust. Whereas many profit-making advisory tactics occur sporadically, tax management generates benefits continually. Using AAVUL takes these benefits to an even higher level with tax-free results (vs. tax deferred) and an associated death benefit that directly adds to the family’s long-term wealth. According to the 2015 Harris/Jefferson National Advisor Authority survey, tax management is the #2 issue of most concern for advisors in the near term (just behind retirement planning). The 2016 version of the same survey found that taxes were the #2 and #3 “biggest financial concerns” for the two primary investor groups in the study. And, for the group emphasizing return as its objective, taxes were the #1 issue expected to “adversely impact the portfolio in the coming year”. Similarly, the 2016 US Trust study titled “Insights on Wealth and Worth” surveyed investors with a minimum of $3 million in investible wealth, and 55% said, “it’s more important to minimize the impact of taxes when making investment decisions than it is to pursue the highest possible returns regardless of the tax consequences”. The newly released 2017 study from the prestigious CFA Institute found that “Tax planning” was the 4th most in-demand service from wealthy individuals of 13 total services (and just behind the core services of “Asset allocation” and “Financial plan creation”). Equally important, tax planning has the biggest gap among the top five services in what’s demanded from clients and what advisors deliver. Let’s summarize: portfolio taxes matter to advisors and their top clients. Asset location sits underneath any competent tax management service. (Asset location considers the range of investments owned by an individual or family and “locates” each investment in the portfolio structure that will achieve the highest after-tax return.) In fact, of the various tax alpha tactics an advisor employs (e.g. tax loss harvesting; income shifting; gains management, etc. ), asset location offers a predictable structural path. Unfortunately, the Scottrade 2016 RIA study found that of 11 wealth planning services, tax planning ranked 9th in an advisor’s confidence in adequately delivering it (50% of all advisors) and just ahead of the bottom two services related to healthcare planning. When thinking of asset location, advisors consider two investment “locations”: taxable and tax-deferred portfolios. The core premise is to put tax inefficient investments such as fixed income, REITs, actively traded investments (e.g. hedge funds), and the like into tax-deferred portfolios expecting (hoping) that tax rates will be lower in retirement than during the working years. The difference in tax rates should it come to pass becomes the tax alpha an advisor produces. Buy and hold equities paying qualified dividends would sit in the taxable portfolio to avoid each dollar withdrawn from tax-deferred retirement portfolios being taxed at higher income tax rates (i.e. vs. lower capital gains and dividend tax rates). There are two major flaws in this reasoning. First, for these top clients, it’s often incorrect to assume that lower income tax rates will apply in retirement. As our last blog established, a wealthy client has a variety of retirement income sources that are often quite substantial. Second, asset location, as currently practiced, represents a big bet on future federal and state tax policy. Setting politics aside, expecting a decline in federal and state taxes in the face of mounting national and state debt – that grows ever faster because of pension and medical obligations – is less and less likely over time. Simply, the size of the Baby Boom generation and its longevity demographics are fuel to the national debt fire, and increasing tax revenues is a primary method to keep the debt from swelling to an unsustainable level. This list describes advisor-applied variable universal life (AAVUL). While AAVUL is insurance – it comes with a valuable tax-free death benefit – it is foremost an investment portfolio. In fact, for a given dollar contributed, nearly all dollars flow into the portfolio to earn income and gains tax free. Even with the policy’s costs, a high-income, HNW client likely reaches breakeven on these costs in a few years and, then, earns a compounding profit thereafter. Most advisors have had one or more bad experiences with insurance products and their distribution model. While these experiences may make memories, they should not block consideration of innovation. AAVUL represents an entirely new insurance product category that fits tightly to an advisor’s high-demand tax management services. With AAVUL being the ideal asset location container, clients gain an advisor’s expert involvement building and managing a flexible – and tax-free – portfolio that serves as the primary wealth creation platform for decades. A core premise in setting up a tax-deferred retirement portfolio is the assumption that the retiree’s income tax rate will be lower than the marginal bracket during the working years. Unfortunately, for high net worth clients (HNW) in retirement, their substantial taxable income from portfolios, pension payments, social security, real estate rental income, board member compensation, and so forth makes the hope for meaningfully lower retirement tax rates unlikely. Added to this retirement income stream, traditional retirement portfolios with required minimum distributions, may exacerbate these top clients’ overall tax exposure by pushing marginal rates higher, resulting in an even greater tax drag on all retirement income. Therefore, a top client’s pre-retirement income planning requires more sophisticated strategies. Advisor applied variable universal life (AAVUL) provides all the benefits of a Roth IRA without its limitations. Consequently, AAVUL must be considered as an advisor’s core pre- and post-retirement income planning solution. While Roth IRA’s set-up costs are low compared to AAVUL’s insurance costs (that provide the death benefit), the full cost-benefit structure must be analyzed. This analysis considers the ongoing federal and state tax shield – income taxes; capital gains taxes; tax-free cash access – against the policy’s ongoing costs and its unconstrained contribution amounts. 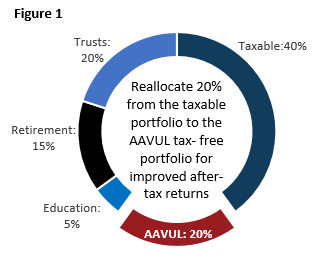 Generally, net of an AAVUL policy’s costs and fees, a family with a blended federal and state tax rate of 35%, 2% premium tax, and an average portfolio return of 6% will earn a positive ROI after six years (see below) and a 40% or higher blended tax rate will breakeven after only a few years. After breakeven, the tax savings compound year after year, making the cost-benefit ROI unlike any other investment portfolio (and substantially better than a Roth IRA since the investor can shield far more wealth from portfolio taxes). Considering the likelihood of high retirement income tax rates, the better wealth planning decision for HNW clients is to avoid investments in tax deferred portfolios and corporate deferred compensation plans, pay the taxes due now while cash flow is high, and take the investable amount into AAVUL. This sets the protected wealth on a tax-free course with compounding gains from the tax savings for decades to come. It’s amazing how one day can change a client’s thinking about portfolio performance. Leading up to December 31st, communication and reporting form expectations, but on January 1st, these expectations transform to a client’s reality. Since performance is numerically driven, it’s easy for clients to focus on the report itself and lose sight of how an investment program executes a wealth plan. Beneath the tables and charts is a core element essential for funding a wealth plan: investment efficiency. Efficiency considers the portfolio amount at the beginning of the year and the amount left over after accounting for increases (deposits, portfolio income and growth) and leakages (market losses, if any, fees, taxes and withdrawals). These leakages, regardless of the source, cause dollars to be lost. And, not just a single dollar, but the compounded value of a lost dollar. 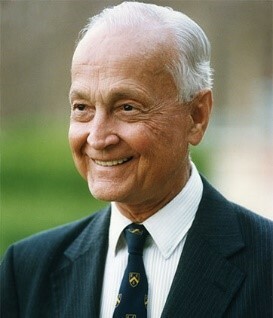 Leakages result in inefficiency, leading to an important truism – you can’t create wealth unless you first protect it. This dollar-level view is critical in understanding the investment program’s track to funding the client’s needs and aspirations. In other words, needs aren’t funded through percentages and investment statistics, but through dollars. An investment plan that isn’t producing sufficient dollars in the short-, mid-, and long-term horizons will fail the client regardless of whether portfolio performance exceeds a benchmark. “Income needs aren’t funded through percentages. An advisor can’t control market performance. The two areas that enable an advisor to affect directly the production of net investment dollars are: 1) investment fees and 2) tax alpha. Much more significant to portfolio performance is the erosive impact of portfolio income and capital gains taxes. Investment return is comprised of two sources: income (interest or dividends) and appreciation (above cost basis). Both these sources are exposed to taxes. Whereas the difference between low- and high-cost investment product fees may be 1% to 2%, portfolio taxes cut deeply into return, over 50% in marginal rates in high-tax states. This significant tax leakage occurring each year quickly erodes wealth; these tax payments are lost to compounding. For this reason, tax-free portfolios, such as institutions enjoy, have a much smoother growth trajectory simply from compounding the tax savings. The concept of “added value” is simple: “Was more value produced than the costs?” For many advisory services, it’s difficult to point directly to specific actions that add value to clients’ wealth. Tax alpha is one service that an advisor controls, and one that delivers a path to accelerated wealth creation. The key is to generate this added value for the client at the lowest possible cost, just like the difference between active and passive investing. Tax alpha through advisor applied variable universal life (AAVUL) insurance is a tax-free portfolio that produces tax alpha in one step compared to other tax alpha tactics that are laborious (e.g. tax-loss harvesting; income shifting; product selection). Clients with blended federal and state tax rates of 35% or higher will reach breakeven from AAVUL (net of expenses) in a few years or less, with compounded wealth creation lasting decades. The HNW market is generally risk averse. This is particularly true as your top clients get older and wealthier. In constructing your top clients’ investment portfolio, allocations to low risk investments – fixed income, REITs, alternative investments – deliver a counter-balance to anxieties resulting from an unstable and uncertain investing environment. An unfortunate reality is these investments delivering wealth-protecting benefits bring with them a constant wealth-reducing leakage: increased taxes. This is the advisor’s dilemma. Advisor-Applied Variable Universal Life (AAVUL) eliminates the advisor’s dilemma. Unlike permanent life insurance in which you lose oversight of the client’s wealth, AAVUL puts you in the central role as the builder, manager, and monitor of the policy’s underlying portfolio. The wealth-preserving investments essential to reducing your clients’ market anxieties are allocated into AAVUL, and the portfolio gains perfect tax efficiency. This is: tax-free portfolio income; tax-free growth; tax-free cash access; tax-free death benefit; no alternative minimum tax. Here’s the key point: Eliminating taxes, otherwise incurred in a taxable portfolio, increases your clients’ after-tax returns. A wealth advisory business that builds itself around satisfying its client’s most pressing needs – risk aversion, wealth protection, and better investment returns – is on the fast-track to accelerated growth. In one step, AAVUL gives you a straight-line path to meeting your clients’ top needs. This is the epitome of a high-value service.